NEVER BEFORE OR SINCE CONFEDERATION had a Canadian prime minister been so continually challenged as during the Second World War. 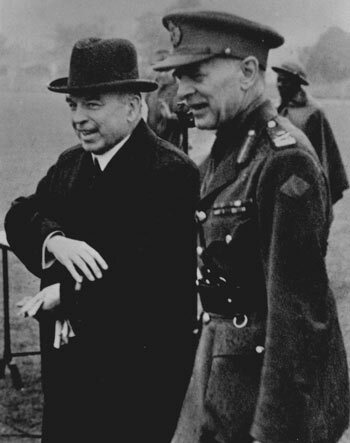 The life and death struggle in which thousands of Canadian soldiers were engaged, the conscription of industry, world military threats, the death of his two closest political allies and the invasion of the nation's founding nation, all combined to keep William Lyon Mackenzie King (pictured, below, with General McNaughton at Aldershot, England in August, 1941), and his cabinet in a state of constant alert. It was not supposed to be a time for politics but that is exactly what it became. Elected in the 1940 general election on a no-overseas conscription platform, the 67-old prime minister commanded another robust majority in Parliament. However, in January, 1942, in the wake of Winston Churchill's dramatic speech in the House only three weeks earlier, King began to feel the pressure for overseas conscription. "The powers (to conscript) may not be exercised for the purpose of requiring persons to serve in the military ... outside of Canada and the territorial waters thereof." The Quebec ministers kept a strong vigil over King's anti-conscription predisposition, reminding him of the terrible divisiveness of the World War 1 decision to conscript Quebec men for overseas battle. By January, 1942, Japan and the United States had joined the war. Australia had implemented conscription. Invasion of England was a very real threat. Battle royal was raging on the Russian front. And now, Arthur Meighen was rising from his Senate grave to accept the leadership of the Conservatives, vowing to implement conscription "over the whole field of war." The surprise came during the Speech from the Throne opening the Third Session of the Nineteenth Parliament. "My ministers will seek from the people, by means of a plebiscite, release from any obligation arising out of any past commitments restricting the methods of raising men for military service." Four days later, the conscriptionist Conservative opposition tore a strip off King. A plebiscite? RICHARD BURPEE HANSON - Leader of the Opposition (York-Sunbury; image): Mr. Speaker, the course suggested by the government is the greatest exhibition of lack of national leadership this country has ever witnessed! As one newspaper has said, "never were so many humiliated by so few." We cannot win this war by plebiscite. Germany does not carry on war by plebiscite. Let this government rise to the level of its duty! Let it not be afraid to lead! A plebiscite is not a policy! It is the negation, it is the avoidance of a policy. It is a declaration of impotence! What will the government do if the plebiscite is indecisive; if the majority is to small? Will it say that, expedient having failed, we shall try another course? Meantime, while Nero fiddles, Rome burns! And what if the plebiscite is rejected by the people of Canada? Will the government resign? Or will the Prime Minister endeavour to carry on, cabin'd, cribb'd, confined, by a self-imposed vow which renders it impossible to carry out his pledge to the people of Canada that he will meet total war with total effort. King responded immediately, and proceeded to give one of his longest speeches. Mixed with rhetoric, statistics, history, politics and military strategy, the prime minister explained that his government needed freedom from past commitments. He only had three options: a general election, a referendum or a plebiscite. RIGHT HON. WILLIAM LYON MACKENZIE KING - Prime Minister (Prince Albert): As for a general election, it would not, we believe, be in the interest of the people themselves, in the existing crisis, to leave the country without a Parliament for the time which it would take to hold a general election. The objection to a referendum on conscription is that far from freeing the hands of the government, it would be a specific request to the people to make a decision with respect to conscription. A plebiscite differs from a referendum in that a plebiscite is taken to ascertain the views of the people, whereas a referendum is a request for a decision by the people on a specific plan or project. The government does not believe that it would be fair to the people to ask them to make military decisions. In consulting the people, we are not shirking responsibility, we are asking for full responsibility. "Are you in favour of releasing the government from any obligation arising out of any past commitments restricting the methods of raising men for military service." Of the 2.9-million voters, 64 per cent replied "yes". But in Quebec, the vote was 3 to 1 against it. King wasted little time in implementing the result. On May 8, 1942, he informed Parliament of his intention to table a bill to repeal §3 of the Mobilization Act, explaining his new policy as "not necessarily conscription, but conscription if necessary." On July 7, the second reading vote was taken on King's bill and carried, 158-54. The prime minister managed to avoid conscripting Canadian soldiers for overseas service for another 26 months. His and Canada's troubles were far from over.